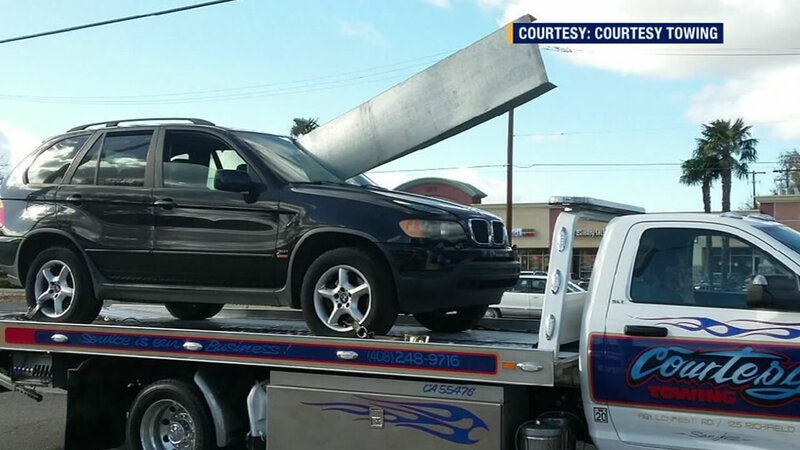 SAN JOSE, Calif. -- Officials said a man driving an SUV ducked to avoid getting hit by a metal beam that pierced through the windshield on southbound Interstate 280 in San Jose last Thursday. The piece of metal sticking out of his windshield somehow got loose from a truck he was following on I-280. The driver said he saw the metal coming, but couldn't veer left or right because there were cars around him, so he ducked to avoid getting hit. Firefighters said he walked away with just a scratch on his arm. Officials said the owner of the truck will get a ticket for spilling a load.